MADISON-Donald Otto Cunningham, age 83, of Madison, passed away on Sunday, June 29, 2014. He was born on Aug. 30, 1930 in Madison, the son of Otto and Goldie (Dairy) Cunningham. He married Rosemary Gasser on May 20, 1951, at Truax Army Base. Don attended Madison East High School and entered the U.S. Army where he served in Japan and Korea. In 1950, he entered the U.S. Air Force and served until 1966, when he entered into a private business. Don was the owner and operator of Interstate Shell in DeForest. He was very active in the VFW, where he served as a state commander after retirement. 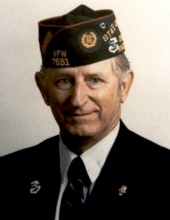 Don was also the founding member of the Galen Day VFW Post No. 7591 in Madison. He looked forward to annual trips to Jackson Hole with his brother and nephews, and enjoyed hunting and fishing in Colorado and Wyoming. Don is survived by his children, Debra Wingfield, Theresa Soerens and Jeff (Cathie) Cunningham; four grandchildren; nine great-grandchildren; one great-great-granddaughter; and brother, Milo Cunningham. He was preceded in death by his wife of 58 years, Rosemary Cunningham; his parents; step-father, Otto Schloemer; his granddaughter, Jeanette Peschl; grandson, Donald Peschl III; son-in-law, Larry Soerens; brothers, Loren and Byron; and sisters, Edna Rabuck, Donna Jean Thorpe and Geraldine Feist; and sister-in-law, Betty Cunningham. Funeral services will be held at GUNDERSON EAST FUNERAL HOME, 5203 Monona Dr., Madison, at 11 a.m., on Thursday, July 3, 2014, with the Rev. Susan Schneider presiding. Burial will be at Roselawn Memorial Park with military honors. Visitation will be held at the funeral home from 5 p.m. until 7 p.m., with pass and review at 6:30 p.m., on Wednesday, July 2, 2014. In lieu of flowers, memorials may be made to the Galen Day VFW Post No. 7591. Online condolences may be made at www.gundersonfh.com. Visitation will be held at the funeral home from 5 p.m. until 7 p.m., with pass and review at 6:30 p.m., on Wednesday, July 2, 2014. Funeral services will be held at GUNDERSON EAST FUNERAL HOME, 5203 Monona Dr., Madison, at 11 a.m., on Thursday, July 3, 2014, with the Rev. Susan Schneider presiding. "Email Address" would like to share the life celebration of Donald Otto Cunningham. Click on the "link" to go to share a favorite memory or leave a condolence message for the family.